Although Mother’s Day can be tough when you are struggling to conceive, for infertility survivors it becomes a milestone to celebrate. Samantha remembers the pain she felt at not being able to conceive. She had been trying for a baby for four years with husband Luke before seeking medical help. We are delighted that over 100 mums and their partners will be celebrating this year following treatment at our hugely popular satellite clinic in Wickford. Following the success of this little clinic, next year will see the eagerly-awaited opening of Bourn Hall’s brand-new full-service fertility centre in the town. Our success rates are excellent, with 35.6% of patients under the age of 37 becoming pregnant (after IVF with blastocyst transfer) and a whopping 51.5% pregnant following IVF with ICSI. We caught up with some of Wickford’s most recent new mums who will be celebrating their first Mother’s Day this year. Amira is mum to nine-week old Ismail. “ I cannot put in to words what being a mum feels like,” she says. Amira has always loved children, and working as a Nursery Nurse means she has been surrounded by them every day for the last 13 years. “It just feels so amazing to have a child of my own. I feel so lucky and grateful,” she smiles. 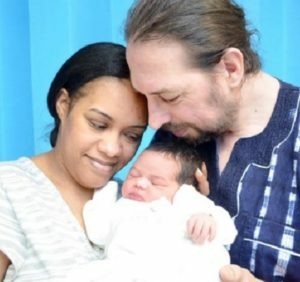 Amira is pictured above with her husband Stuart and baby Ismail. Hayley has a double reason to celebrate Mother’s Day. 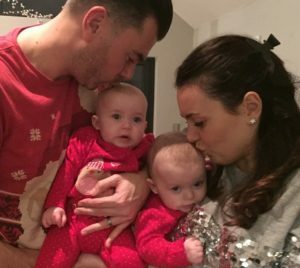 Now the proud mum to eight-month-old twins Layla and Honor, she found out she was pregnant on her husband Paul’s birthday. “People always used to say to me when I was trying to get pregnant that I would make a great mum. You don’t really know what to expect until you actually have children but I am loving it. The girls are just lovely and I couldn’t be happier.” Hayley and Paul are picture below with Layla and Honor. Emma’s little boy was born in July; she says: “Mother’s Day was really difficult. I would think ‘maybe next year it will be me’. I found it hard feeling happy for other mothers. “We got married when I was 34 and we had been trying for four years before I became pregnant after treatment at Wickford. They are really friendly at the clinic, Grace is truly amazing and the receptionists always recognised me. To find out more about our Wickford clinic please click here.